It’s not always easy to break the mold and deviate from the standard practices of an industry. Created within the framework of a culture deeply rooted in relationship-based service, honesty and respect, Coastal Container is striving to do just that. Founded in 2007 and located in Holland, Coastal Container produces packaging solutions for the manufacturing industry. Its primary product is corrugated boxes; however, the company manufactures a variety of containers and packaging materials. Its facility spans 250,000 square feet and employs about 160 workers. Coastal Container has made sustainable and responsible practices an integral part of its production process, and that includes the building they call home. 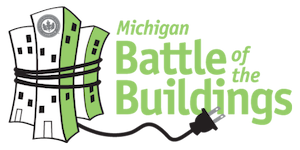 As this was its first year competing in Battle of the Buildings, Coastal Container set a primary goal of reducing its energy consumption and improving efficiency. The company brought on Midwest Energy Group, a consulting firm specialized in energy management and efficiency, to provide professional guidance. The Midwest Energy team also coordinated with Coastal Container to help it earn energy efficiency rebates from its local utility company. Pictured from left to right: Cheri Holman – USGBC West MI, Bill Baumgartner – Coastal Container. Over the course of the 2016 calendar year, Coastal Container reduced its weather-normalized source building energy use by an impressive 19.3 percent. Contributing significantly to this reduction was an upgrade to the facility’s boiler system. The boiler heats the building by using post-consumer wood waste from Holland-area businesses. Previously, the system’s inefficient operation required the added purchase of natural gas to meet winter heating demand. The boiler system improvements have eliminated that need. “Our drive for continuous improvement is finally paying off,” says Coastal Container superintendent Curt Shosten. A smaller, yet significant project involved the installation of variable frequency drives (VFDs), which control motor speeds by gradually increasing voltage, rather than using 100 percent voltage when the motor is turned on. Midwest Energy Group introduced Coastal Container to VFDs, the use of which does not affect production. Machine operators and maintenance crews responded positively to the training required for the new technology. Coastal Container designs all its products with sustainability in mind, and recycles all plastic materials. The company also collects all scrap corrugated material and returns it to the paper mill for reprocessing. All Coastal Container corrugated materials are SFI Certified™, which signifies that these materials come from legal and responsible sources. The company is now considering retrofitting its conventional lighting system with more energy-efficient LED lights. In an industry that is widely known as being one of the least energy-efficient and sustainable, Coastal Container is taking great strides to change that.